Last Saturday I followed my dowsing rods to the Northeast part of South HIll and found the most interesting stone mound. It is about 15 by 20 feet in size. 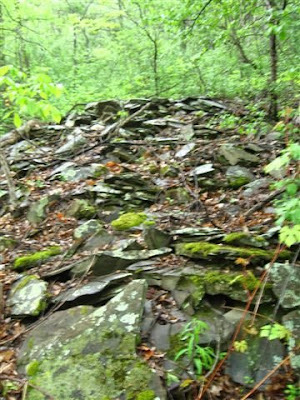 I am pretty confident that it is a Hopewell Adena Mound like the others we have found on South HIll because it is situated on 3 earth chakras. As I noted previously NY state archealogist felt that the numerous mounds on top of South Hill were made by the Hopewell and Adena. 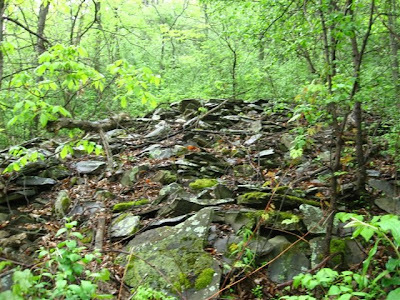 The stone mound is located on a steep part of the moutain so it is highly unlikely that any farmer made the pile by clearing the area. It strategic location on 3 earth chakras also gives credence that it is like the other mounds made by the mound builders. As the pictures show it is located in a thick thicket that has not seen humankind for some time. Most of the stones are flat and it is clear that whomever constructed it was intentionally making something. Most likely the structure was flat on the top as Ritchie noted with the other mounds. It may be that the mounds were terraced in three steps. One of the pictures shows my dog Pepper on what may have been the top terrace. All said it is a pretty remarkable find. Do not be swayed by the broken look as this pile of stones was constructed thousands of years ago. The thick thicket around it has served to protect it from intruders. The pictures do not do it justice to it and does not show the sharp incline it is situated on. I did not have enough space to manuveur to take a better picture to show the true scope of the mound or how it is situated on a steep embankment. 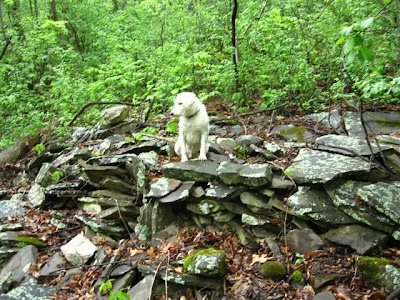 My dog Pepper is on what appears to be the top terrace of a terraced mound or the last remaining flat-top.